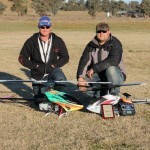 The New South Wales F3C State Titles are back after a long time away. The event will be run over the June Long weekend, (9th-11th)2012. This event will also be a team trial for the Australian F3C team to attend the F3C World Championships in Poland 2013. Two of our Pilots will be attending, Andrew Stampalia And Tim Brookman – Good luck boys!